Many biotechnology applications use the ability to multiply a single cell type or organism to create a pure culture for downstream operations. Accurately monitoring cellular growth in culture ensures that the necessary population exists to provide sufficient biomass for downstream applications. Bacteria, yeast, plant, fungi, and mammalian cells are used extensively in areas such as vaccine development, molecular biology, genetics, drug discovery and development, and in bioproduction. Methods have been developed to allow mass culture of many specialized cell types including those used to produce biological agents using recombinant DNA technology and to study signal transduction and cellular toxicity. Bacteria are relatively simple, robust organisms that reproduce quickly, are cost-effective to grow and maintain, and are easy to manipulate. As such, bacteria have traditionally been considered the workhorses for many biological applications. Yeast strains are significantly more complex than bacteria, but still divide rapidly and are also relatively simple to maintain. As their physiology is more complex, yeast may be a more suitable model than bacteria for some preliminary studies targeted at better understanding mammalian systems. Mammalian cells are considerably more expensive to expand and maintain in culture, requiring complex media and special care to prevent contamination. Mammalian cells can provide a more relevant background for a wide variety of biological studies. However, once cultured in vitro, the original tissue’s architecture is lost, and the cell’s normal behaviors and functions may change considerably or disappear. Yet, the ability to culture relevant mammalian cell lines remains the gold standard for many current research and development efforts in the biological sciences and in biotechnology and pharmaceutical industries. A common and rapid technique to measure cell growth in microplates is light scattering using the absorbance mode of microplate readers, typically using a wavelength of 600 nm. This choice is due to the relative transparency of culture constituents at this wavelength and the fact that scattering of light is proportional to cell density. Since this is a measure of optical density and not molecular absorbance defined by extinction coefficients, results do not follow Beer’s law and are not necessarily linear. The extent of light scattering is a function of the reader’s optics, including slit geometry and size, measuring distance, and light intensity as well as cell morphology and, as a result, normalized comparisons from reader-to-reader and organism-to-organism are impossible. Additionally, light scattering does not differentiate between living and dead cells, and thus alternative methods may be required in conjunction with absorbance methods. Nonetheless, light scattering is a rapid and nondestructive analytical method commonly used for cell-growth analyses (Figure 1). A benefit to performing light-scattering measurements in microplate format is obviously higher throughput, allowing more samples or growth conditions to be tested in parallel. Furthermore, small well volumes mean that less reagent and sample are necessary, resulting in cost savings. Additional savings are seen by eliminating the time spent and potential for operator error by alleviating the need for sample transfer from culture vessel to sample cuvette. Finally, one is assured that environmental conditions remain constant throughout testing, as the incubation chamber is integrated in the microplate reader. Microplate-based cell-growth assays using light scattering fall into two general categories: end-point and kinetic. End-point assays use a single absorbance or fluorescent measurement at the end of a growth period to quantify cell density, thus aiding in the quantitative determination of product formed or expressed, and substrate consumption rates. Typically, end-point measurements are more automation friendly, less affected by minor external influences, and require a blank measurement. 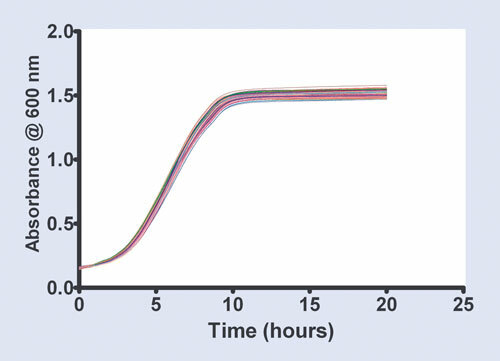 Kinetic assays use continuous monitoring throughout the cell-growth cycle to detect subtle changes that may be affected by metabolite production, protein expression, promoters/inhibitors, and cell-signaling events. These changes may provide valuable information during the growth cycle, including insights into signaling pathways that would otherwise be missed in an end-point assay. Kinetic measurement using light scattering, especially in a microplate format, is not without its challenges. Accumulation of expressed proteins or by-products of metabolism can quickly cause toxicity resulting in cell death. Additionally, a notoriously common problem for yeast strains and some bacterial or mammalian cell lines is cell aggregation. Both can be problematic for microplate-based assays with little culture area and volume per well. In larger culture vessels, clumping is minimized through continuous shaking on an incubated orbital platform. In microplate format, a kinetic-capable reader must be equipped with temperature-controlled shaking. A robust microplate reader, such as BioTek Instruments’ Synergy™ H1 Hybrid Multi-Mode Microplate Reader, provides precise temperature control and optical density measurements for bacterial, yeast, and mammalian cell growth assays, and also includes orbital shaking for cells prone to aggregation. In addition to kinetic assays, Synergy H1 offers end-point, spectral scanning and well-area scanning in absorbance mode, and is also capable of running fluorescence, fluorescence polarization, time-resolved fluorescence, and luminescence assays. A four-zone heating system monitors incubation temperatures up to 45°C for uniform temperature across the plate, while continuous shake/read cycles are possible up to 48 hours or more without interruption. Figure 1. 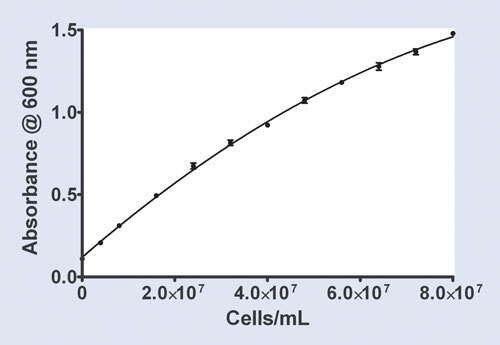 Graph shows 600 nm absorbance of cultured yeast cells versus increasing cell number. The data is best described by a second order polynomial. Orbital, linear, and figure-eight motions offer variable shaking speeds and amplitudes. Orbital shaking helps to keep cells uniformly separated and equally nourished within microplate wells through all growth phases, thus facilitating accurate light-scattering measurements (Figure 2). Accurately monitoring cell growth is a vital step required when using a variety of cultured organisms in a wide range of biological research areas. Regardless of the organism, robust end-point and/or kinetic cell growth studies, performed on an equally robust microplate reader, can assist in generating essential information required for efficient downstream applications. Figure 2. Comparison of kinetic yeast growth measurements from a 96-well microplate: Uniform temperature control and shaking provide consistent growth rates across the plate. Peter J. Brescia Jr. (bresciap@biotek.com) is an applications scientist at BioTek Instruments.